You are just plain stuck. The role you have caring for your parent or spouse is exactly what you are supposed to be doing. But you find yourself feeling trapped by the overwhelm of all that needs to get done never knowing what will come next. You wonder where the room is for you to do what you enjoy and take care of your own relationships. You would love a life where you feel like what is on your plate seems manageable. You want to enjoy caring for your loved one because you also have the time to delight in your own interests. 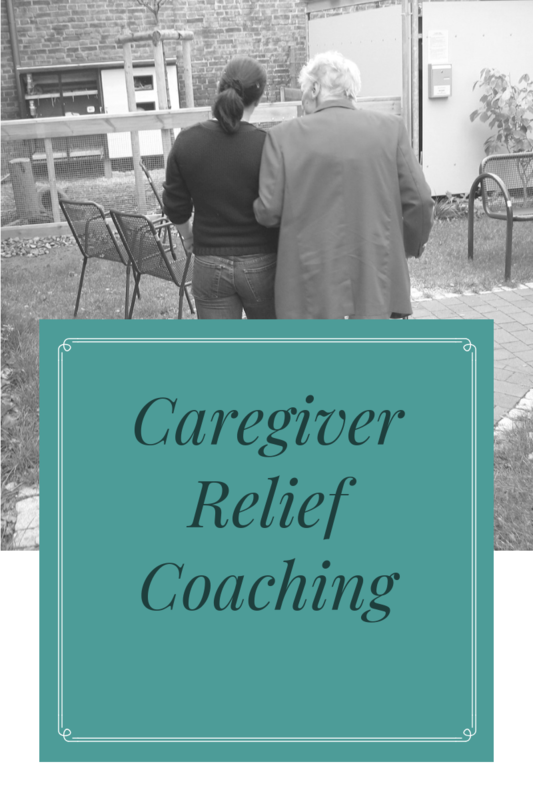 Caregiver Relief came out of my experience supporting friends that care for their loved ones and working with daughters and wives that care for their loved ones. The program faces those aspects of caregiving that are so draining and works through your day-to-day schedule to find the room to care for yourself and do what you enjoy. The purpose is to move you from a life where you roll along from crisis to crisis to a life of intentionally caring for your loved one and caring for you too. Let’s meet for a strategy session to determine if we are a good fit for each other. This will also give you a chance to experience a coaching session and have your questions answered. My clients tell me that they have walked away with valuable insights and hope after just one session. My goal is that you will as well. Then based on our strategy session you will complete the discovery paperwork and hand-picked assessments to pave the way for our work together.